We enjoyed this menu so much for our recent Thanksgiving dinner, that I’ve been recreating dishes from it all month long and incorporating them into our weeknight dinners. There’s also a pretty good chance that Christmas dinner is going to look very similar to the plate above. After all, why mess with a good thing? 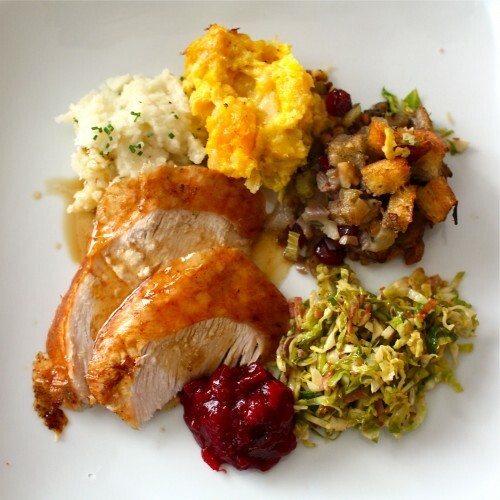 This suggested holiday menu is designed for Thanksgiving or Christmas, but is simple enough to prepare for Sunday dinner. 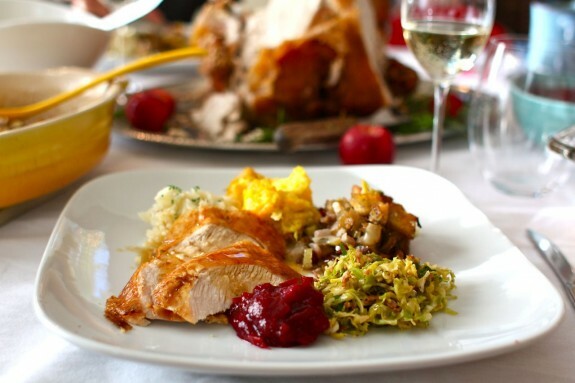 To pare it down in to a more manageable meal, ask friends to bring dessert and rolls, while you roast a turkey breast and prepare mashed potatoes, stuffing and a vegetable. 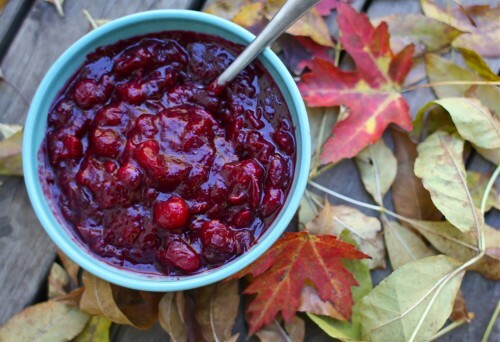 Round off with a jar (or can) of your favorite cranberry relish or sauce and dig in! Here are the quick links for our feast. Further below, I’ll highlight each recipe with a photo and share what makes it special. The best way to roast a turkey really IS the simple way. 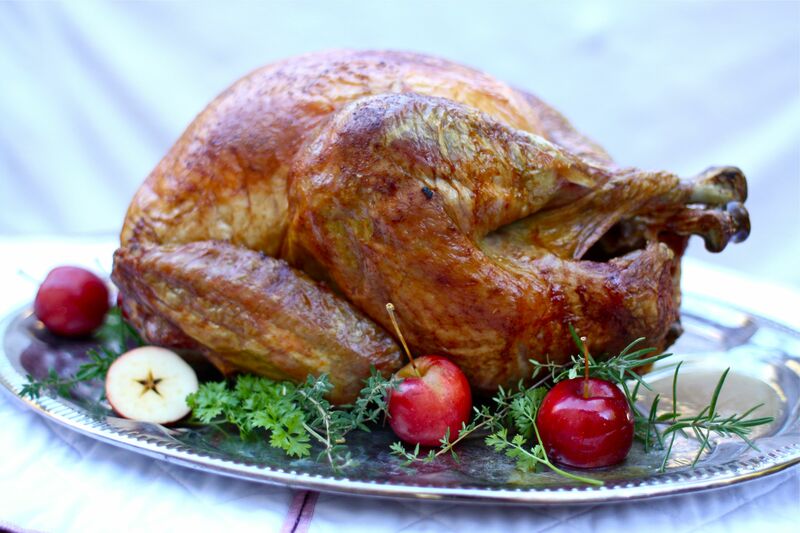 Head here for my tutorial on roasting the whole bird, plus a quick recipe for turkey stock. My sister added buttermilk to the mashed potatoes this year, demonstrating yet another delicious add-in for this Thanksgiving dinner staple dish. 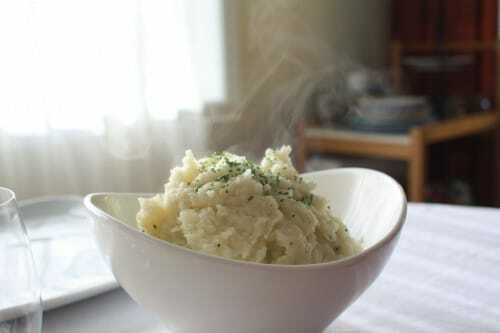 Head here for our tips on fluffy mashed potatoes, plus more suggestions for creative flavorings. 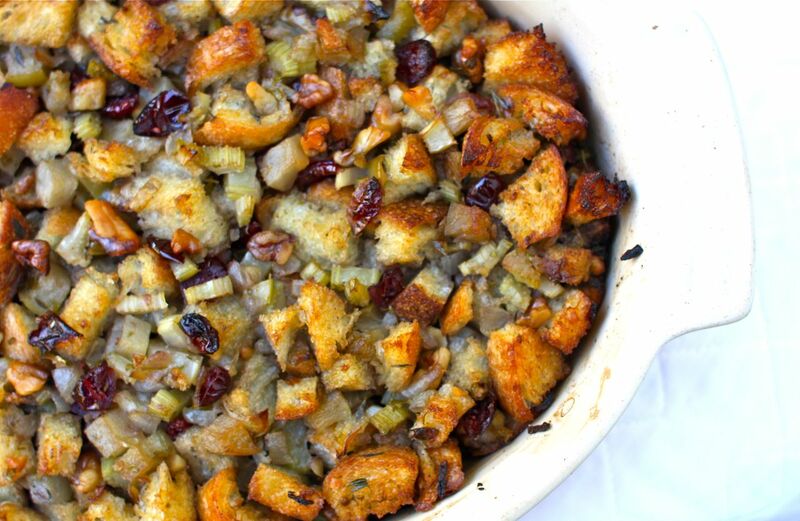 It doesn’t matter whether you call it stuffing or dressing, just don’t roast it in the turkey! Head here to read my reasons for cooking the stuffing on its own and my own favorite recipe for Fruit & Herb Stuffing. My favourite cranberry sauce comes together in just a few minutes and can be made up to a week in advance. Combine all ingredients in a medium, heavy bottomed pot and bring to a simmer. Cook gently for about twenty minutes, stirring occasionally. Remove star anise or cinnamon stick and transfer the sauce to a bowl to cool. Serve or store in a jar for up to one week. 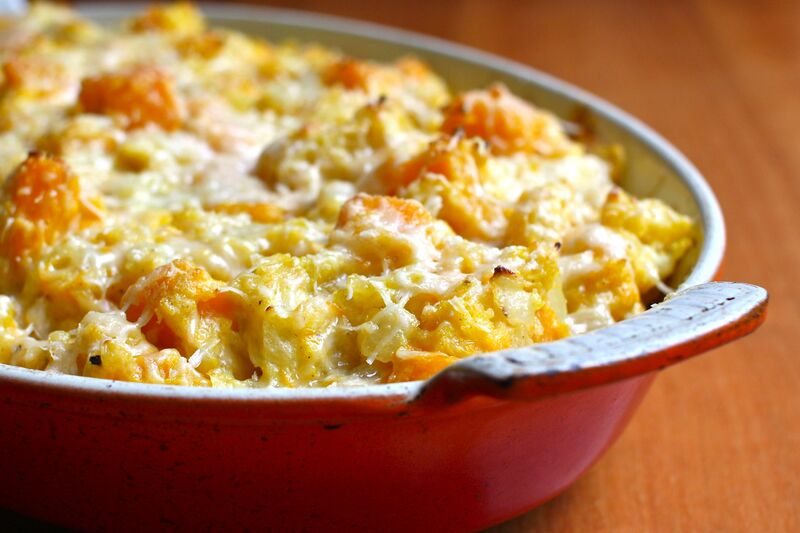 This was my most popular post all October and readers are still writing to say how much they love this quick and easy gratin! It is truly delicious, requires only basic pantry ingredients, and lends itself well to planning ahead. Our green vegetable of choice is brussels sprouts, and this remarkable ‘stir-fry’ is so good, it has made a few converts. Head here for the recipe and learn more about this cruciferous vegetable that is still in season for a few more months. I’ve always thought that a perfect Thanksgiving meal should include a dinner roll, and these these easy buns are just the ticket. 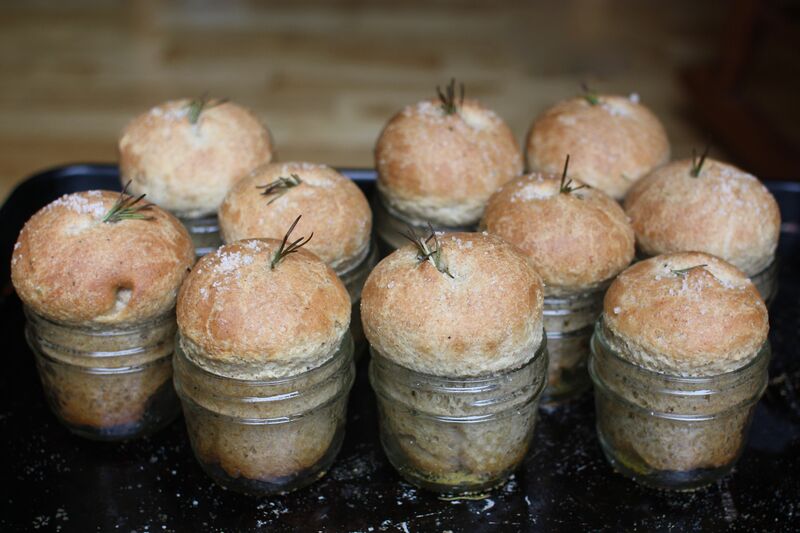 Softened by the addition of butter and lightened with buttermilk, my whole-wheat dinner rolls are baked in a little jam jar for extra points on presentation! Post includes tips on working with whole-wheat flour as well as a short video demonstration for shaping the rolls. 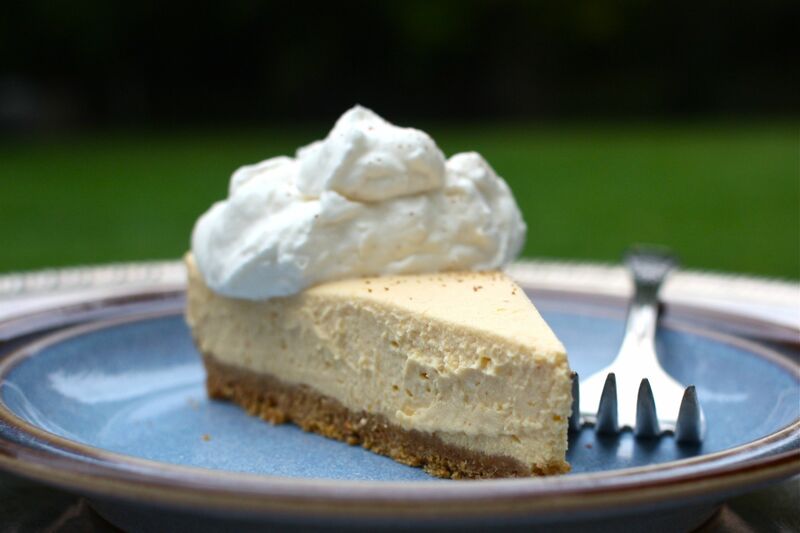 You can’t go wrong with cheesecake for dessert, and I’m convinced this chilled pumpkin cheesecake only gets better after a day or two in the refrigerator, making it the perfect do-ahead dessert. This post is brought to you by Plan to Eat, because as much fun as it is to prepare for a big holiday meal, the everyday eats require some planning too! For grocery lists, weeknight recipe ideas and handy menu planning tools, there is Plan to Eat. Did this round-up make you hungry? Which dish suits your fancy? Great recipes Aimee. Happy Thanksgiving to all of you south of the border! Here’s hoping you enjoy lots of family, fun and great food! Cheers! Making cranberry sauce is so easy, I will never buy it in a can again! My recipe is almost the same as yours….but if I have some around, I add a bit of orange liqueur as well. MAN, it’s good! Cranberry sauce is one of the things that I’m brining for THanksgiving this year – this recipe sounds perfect!! Can the roll be made without a stand mixer? Unfortunately, I just have a hand mixer, but would love to make these rolls. Any tips on how to make them without a stand mixer? Great collection of recipes. I love how you did the buttermilk biscuits-so cute! These recipes look soo tastey its making my mouth water. The cheese cake is my favorite. See, here’s the thing: all of that looks delicious and incredibly edible. Mmm, those dinner rolls look amazing; love the jam jar presentation. I make a similar cranberry sauce but with ginger instead of cinnamon and a splash of Grand Marnier. I love how you’ve thought it all out for those of us who are entertaining-impaired. Looks fantastic!